​Fat Tire Ride of Lake Geneva is a fun bicycle ride on paved roads around Geneva Lake Wisconsin, beginning at 9AM with an unorganized start time. Begin the ride at your leisure from Champs Sports Bar & Grill in the City of Lake Geneva or The Ridge. Proceeding at your own pace, the ride is approximately 21.5 miles and the “rest” stops are evenly spaced. Participating businesses are Champs, The Owl Tavern, Gordy’s Boat House, Chuck’s Lake Shore Inn, Harpoon Willies, Lucke’s Cantina, Pier 290, Bar 55, and Mars Resort. The ride is held rain or shine and travels through Lake Geneva, Fontana and Williams Bay with great views of Geneva Lake and Lake Como. Fat Tire Ride of Lake Geneva is our annual bicycle ride on paved roads around Lake Geneva, Wisconsin. We have been around since 1996! 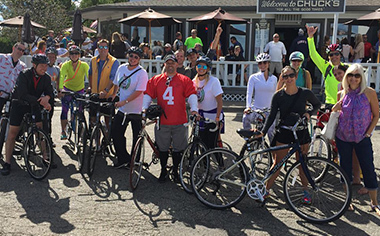 Join us on September 14th this year in Lake Geneva for our fun 21.5 mile bike ride with a pig roast, costume contest and more! When is the cutoff point for registration? Will we receive a free t-shirt? Check out the FAQ section for answers to your questions! September 14th is racing up fast!